← for the love of shorty! We received a new Lillebaby for our lending library, and I got the opportunity to play around with it for the first time this week. I was very impressed with this full buckle carrier to say the least. If I could only pick one word to describe the Lillebaby, it would be VERSATILE. The Lillebaby is a soft structured carrier (SSC) with all the bells and whistles. After testing out all its features and even trying it on with my own son, I have to say I’m a big fan. Here’s a rundown of this carrier from my perspective. 1. The Lillebaby has all the safety features you would expect for a high-quality SSC; such as safety elastic for the waistband buckle. Something it has that I haven’t seen in very many other buckle carriers is a safety buckle inside the panel of the carrier to further secure your child to you. 2. It is designed to be worn in four different positions: back, hip, front inward facing, and front outward facing carries. You can adjust the width of the carrier’s base to accommodate the outward facing carry or for an inward facing carry with a young baby who is ready to have his or her legs out. 3. This carrier has a nice, large hood for head support while baby is sleeping or to use as a shade from the sun. In addition, it also has a head support feature which can either be snapped down in the outward facing front carry or attached to the shoulder straps to provide more head support for a young baby or further extend the back panel for an older baby or toddler. Adjustable base for newborns to toddlers. For me, the best part of this carrier is how you can adjust the size of the base and the back panel to accommodate a baby of any size. From now on, whenever a mom at one of our meetings asks for a soft structured carrier that will work for both her newborn and her two year old, I’m going to suggest she try the Lillebaby on. 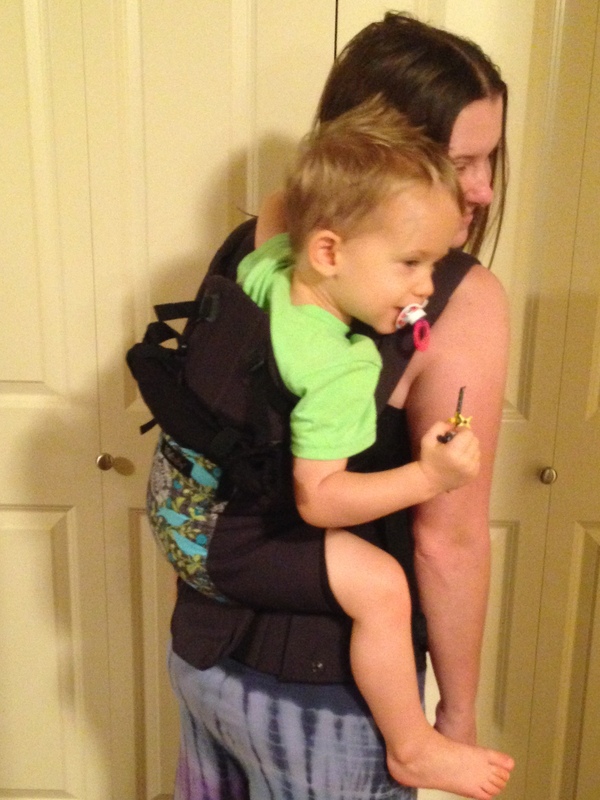 I will also suggest it to anyone who wishes to only buy one full buckle carrier to last them from the newborn stage well into toddlerhood. Many caregivers are also interested in being able to safely carry their children in a variety of positions, including outward facing and hip carries once their babies have adequate head and neck control. 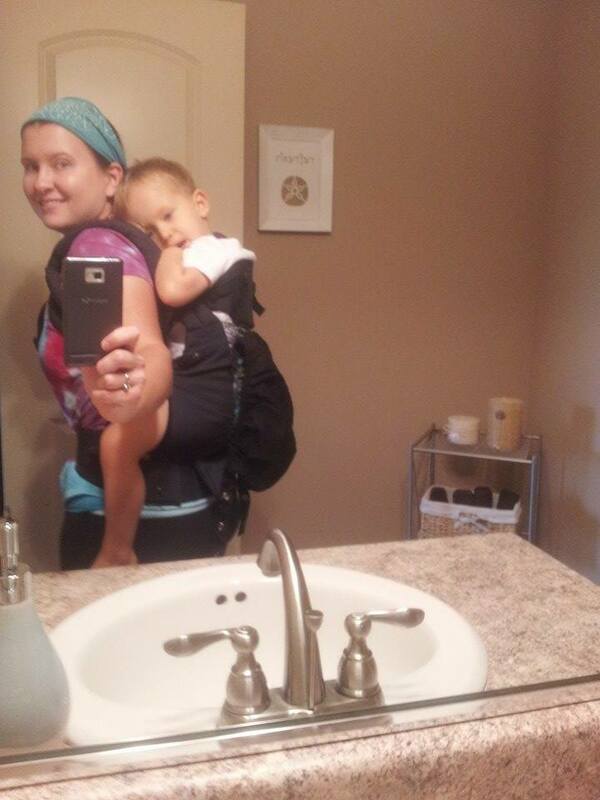 The versatility of this carrier is truly awesome! The only real con I can think of is the fact that all the features and accessories can seem a bit overwhelming at first. However, the Lillebaby comes with very thorough instructions and after an hour of playing with the carrier, I felt that I understood its features well enough to teach it to someone else at a meeting. And I honestly think having all the features makes the learning curve well worth it! I am including a picture of my 2.5 year old in the carrier. He is about 32 lbs and 35 inches tall. Although he is not knee to knee in this carrier, that is not essential in a SSC like it is in a wrap or a ring sling. I have to admit that he does fit into a toddler sized SSC better, but we were both very comfortable for a long time in the Lillebaby. 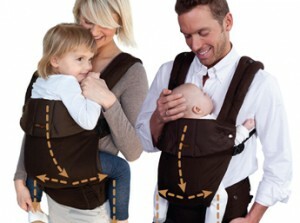 I have no doubt this carrier would work great for babies and toddlers of all ages. Me and E in the Lillebaby. The bottom line: if you have a chance to test this carrier out, do it. You won’t be disappointed! More more picture that shows how high the carrier goes on his back.